I just submitted an article coauthored by Matt Callison to the Oriental Medical Newsletter, a publication of Pacific College of Natural Medicine. This article is the first of two parts and will discuss our research into the sinew channels (jingjin), secondary channels described in Chinese medicine. See Creating a Modern Model for the Assessment and Treatment of the Sinew Channels (Jingjin): Part 1 in the upcoming edition of the newsletter. We have been exploring the sinew channels and building a more complete and comprehensive model of these using the original description in the Lingshu, but also fascial research, our own cadaver studies, and functional anatomy. With this information we have be building a model of these channels which is consistent with traditional channel theory while helping facilitate use of assessment based on orthopedic evaluation, postural assessment, and other functional tests. All of this information can be used then to build treatment protocol for these channels. We will be presenting this information at the Pacific Symposium in San Diego this Fall. One of the concepts discussed in the article is tensegrity and this is used to help understand sinew channel relationships. Increasingly, many holistic health systems which work with posture (Rolfing/structural integration, osteopathy, chiropractic, etc.) use the principles of tensegrity when describing the human body and when describing how their inteventions improve alignment and reduce structural strain. Tensegrity is a term coined by architect Buckminster Fuller and used in his design of the geodesic dome. 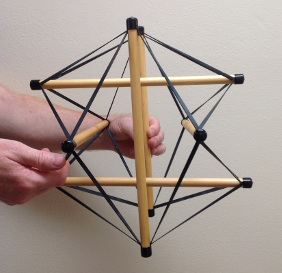 Tensegrity is derived from tension integrity, and in tensegrity structures tension provides the integrity of the structures. 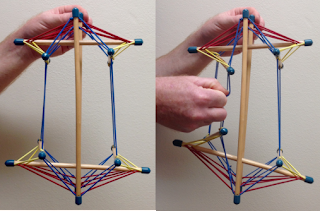 Tensegrity structures, from the simple model in Fig. 1 to the human body, have several features. First of all, they have continuous tension and discontinuous compression. In Fig. 1, the continuous tension is created by the elastic bands, whereas in the body it is the myofascia. This myofascia consists of the muscles and the seamless fascia which connects one muscle to the surrounding muscles and the muscle to the bone via the tendons. The discontinuous compression consists of the wooden dowels in Fig. 1 and the bones in the body. These compression elements do not touch one another (there is a joint space in healthy joints), but are used by the tension elements to have something to pull on and create shape. This is a simple concept, but for those who have studied anatomy and observed a model skeleton in a classroom, a perception can be created that the stacking of the bones is what determines the alignment of body. If a bone is out of place, then it needs to be reset and put back into place. The problem with this perception is that the skeleton is only standing because it is held up by a stand with a chain at the head. Without this and, more to the point, without the tension of the muscles and fascia pulling on the bones, this structure would fall to the ground. But, without the levers of the bones (or dowels in the Fig. 1), the myofascia would be a blob of useless muscle contraction. So, the bones are not stacked one atop another like bricks are stacked in a wall, but, instead, float in a sea of tension comprised of the myofascia. What determines the shape of our structure, then, is the balanced, or possibly unbalanced, tension inherent in the myofascia. In a balanced structure, muscles pull on the bony framework; they have enough strength to perform their movement and supportive roles, but they are not overpowering other muscles (creating muscle imbalances) and their associated fascia is not too bound and restrictive. The sinew channels offer a way of assessing the tensional aspects of the body and how this tension produces or distorts shape. 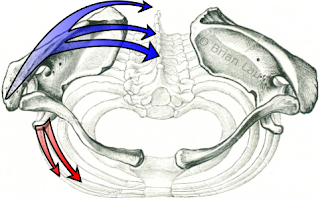 For instance, internally-externally (biao li) related sinew channels work together to create balance across major joint structures. In Fig. 2, the pull of the pectoralis minor (part of the Lung sinew channel and illustrated by the red arrow) coordinates with the pull of the middle and lower trapezius muscle (part of the Large Intestine sinew channel and illustrated by the blue arrow) to produce movements such as scapular protraction. Imbalances are frequently seen where the pectoralis minor (LU) is overactive and pulling excessively, whereas the middle and lower trapezius muscles (LI) are inhibited and failing to withstand the excessive pull of the pectoralis minor. This leads to a postural imbalance where the scapular position is held in protraction causing, among many other things, decrease in the volume of respiration. 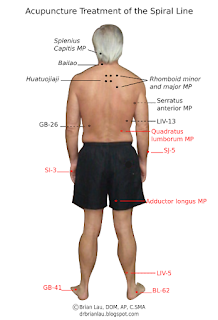 In addition to restriction in breathing, this imbalance can lead to many injuries (see the series of posts on Upper Cross Syndrome, a common postural imbalance resulting in scapular protraction and a head forward posture). Other sinew channel relationships exist, such as six divisions (liu jing bian zheng) and midday-midnight (zi wu liu zhu), that give insight into how the sinew channels interact to achieve overall balance in movement and position. Another feature of tensegrity structures is that they are very strong and come by this strength with little overall materials. They are strong because they disperse force that is put into them. If and when they do break, they often do so at a weak spot in the structure. For instance, if one of the elastic bands was already degraded or a slight cut was introduced and enough force was introduced, this area of damage would likely be where the structure would break. In our bodies, this is often in a region of a previous injury or damage from repetitive motion. Clinically, these relationships can be used to build treatment protocols that balance overactive (excess) and inhibited (deficient) muscles, thereby balancing the sinew channels. Acupuncture to motor points and other ashi points, myofascial release, and corrective exercises are especially effective at treating the sinew channels. This approach is especially effective when combined with TCM to treat any Zangfu dysharmonies using acupuncture points (in combination with motor points), herbs and lifestyle recommendations.